I am a member of Collective Bias Social Fabric Community. This shop has been compensated as part of a social shopper insights study for Collective Bias and their client. We are officially at the beginning of holiday baking season. Many of you have probably already started the baking, but for me, it doesn’t usually start until about the week of Thanksgiving, and then I’m full speed ahead until about December 24th. Much of December is spent trying to find the perfect cookie recipe in preparation for my family’s annual Cookie Bake Off. During December I go through pounds of flour, chocolate chips, peppermint, and sugar. And you can bet that there is a good layer of powdered sugar covering all surfaces of my kitchen. It is just go-go-go. This year, I am going to be sure to slow down a little bit though. Take a few minutes to stop the baking marathon to spend time with those who matter. Besides, that is what life is all about anyway. Slowing down and enjoying those people in your life who mean the most to you. For me, this year, it is going to be especially important to me to enjoy the time I have with my wife. She has made the honorable decision to join the Air Force Reserves and will be away at basic training and tech school for about 6 months of the next year, and to be honest, I’m not sure how I’m going to handle it. Coffee. Coffee is what my wife and I connect over. (actually beverages of all kinds!) 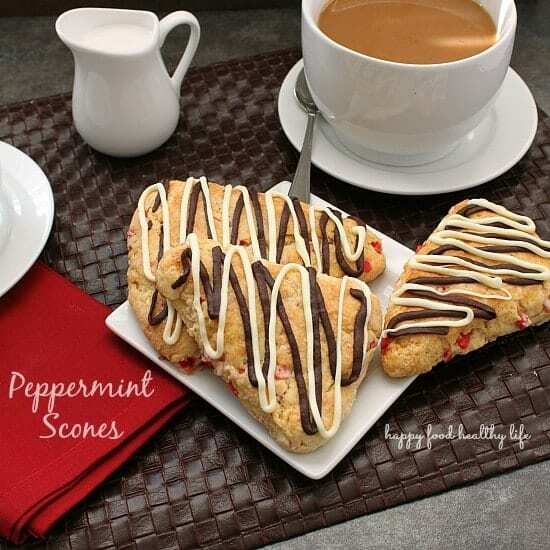 A cup of perfectly sweetened coffee (mine more than hers) is how we always start our mornings, and it’s even better when there are baked goods involved like these Peppermint Scones. The conversations we’re able to have over coffee are moments I will be able to cherish in the coming difficult year. We talk about life, about our last 4 years together, about our future, about the things we still want to do. There is just nothing like it. I know there are still a few more days until Thanksgiving, and I’m anti-“peppermint before thanksgiving”, but I wanted to be able to provide you with a recipe to start your Christmas holiday with. 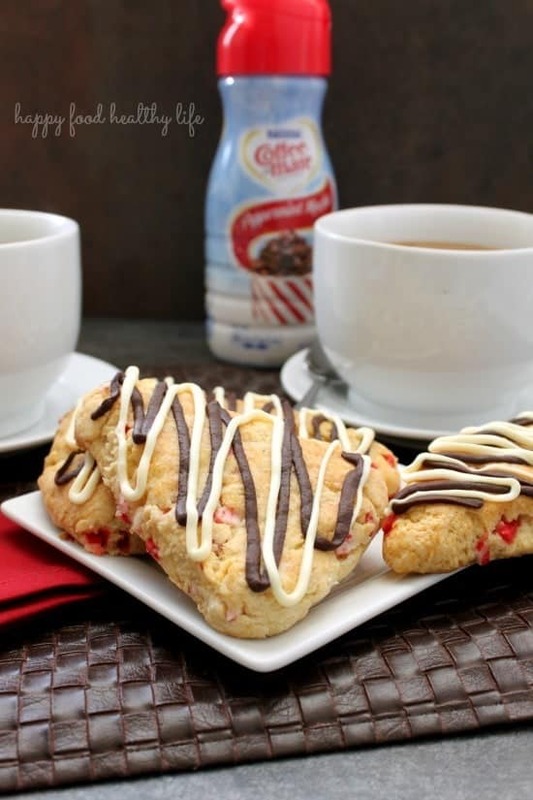 The day after Thanksgiving is a perfect time to create these wonderful Peppermint Scones made with Coffeemate Peppermint Creamer. I want you to remind yourself to slow down a bit this holiday season. Enjoy those around you. Take a moment to connect with your loved ones over a cup of coffee or hot chocolate. It’s not all about the shopping, the marathon baking, and the endless gift-wrapping. For me, it’s about my wife and my son. Life is changing a great deal for us, and it’s going to be these moments over coffee and scones that get me through the change of seasons, the summer BBQ’s, and the movie nights without her. Cut in butter until mixture is crumbly, using a pastry blender. You should have little pea-size balls throughout this mixture. Separate the egg white and the yolk. Set the egg white aside. In a separate bowl, mix together the egg yolk, honey, and Peppermint Creamer. Add to the dry mixture and mix until just combined. You don't want to work it too much or it won't turn out quite as flaky. You don't want a cookie batter consistency. Just barely mixed. Transfer to a greased baking sheet. Whisk the egg white until froth forms and brush over the tops of scones. Mix sugar and cinnamon together and sprinkle over egg-white-topped scones. Bake at 400 degrees for 10 to 12 minutes, until golden brown. 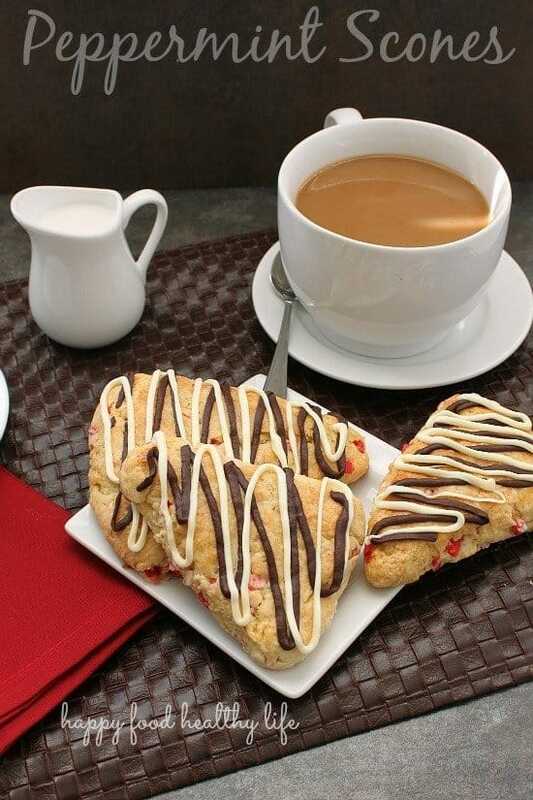 While scones are baking, create 2 separate chocolate drizzles. Create the peppermint chocolate drizzle by microwaving the dark chocolate and Peppermint Creamer for 15 seconds at a time, stirring in between, until completely melted. Once melted, put chocolate into a small plastic sandwich bag, zip up, and snip off a tiny corner. Melt the white chocolate chips in the microwave by themselves. Place in a baggie and snip off a tiny corner in that bag as well. 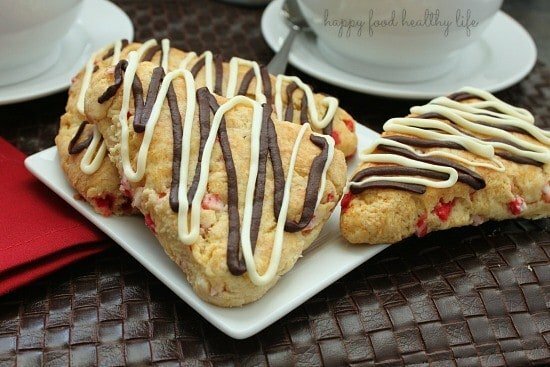 Drizzle the melted chocolate over the scones once they have cooled slightly. Check out this Coffee-mate digital magazine to get great ideas for the holiday. Good think I am not anti pre Thanksgiving peppermint, because I love these Holly! Scones are perfect breakfast food in my opinion, they go so well with my coffee! They really are the best dipped in coffee. Especially when you also put peppermint creamer in your coffee! Pinned it! These looks so yummy. I love scones. We visited Scotland and had scones every day! Jeri I would love to visit Scotland… Especially for daily scones!